It’s no surprise that Stax Diner isn’t a place you choose to go if you’re counting the calories or have just recently promised yourself to cut down on the carbs. So bearing this in mind, I starved myself the whole day to truly indulge at Stax Diner, with just the one hurdle of actually figuring out the exact location. For all of you smart alecks with google maps, it really shouldn’t be a problem. Just tap in the postcode and it takes you directly to Kingly Court (just off Carnaby Street), where you’ll be taken by surprise by the variety of dining options. Stax is located on the first floor. We had a reservation for around 15 people, and little did I know this would mean that we practically had booked out half the restaurant. Nevertheless, despite several warnings of taking away some of the seats due to queues building up outside, the staff somehow managed to cater for our friends who run on their beloved Asian timing. Whilst waiting for the late arrivals, we ordered the cajun popcorn shrimp bucket and milkshakes (Peanut butter, and banana & coconut). The shrimp bucket came piping hot straight out the fryer to our table with the accompanying cajun sauce. Although satisfying, it wasn’t anything special. The banana and coconut milkshake was more of a banana milkshake and a bit of a let down. The peanut butter milkshake was moreish, though thick enough to be called ice-cream (to the point it was eaten with a spoon). Finally after the whole party arrived, we received our burger orders. 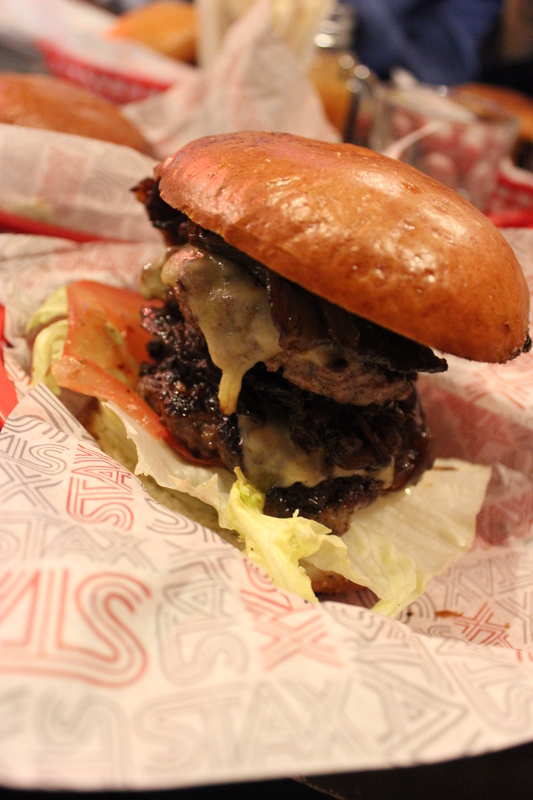 The most popular among the group was the ‘big stax’ burger complete with all fillings plus your choice of cheese. The biggest hype was around the maple syrup bacon, which wasn’t overly sweet, yet managed to add that ‘sweet vs savoury’ touch to the burger. Looking around the table, everyone seemed to be having the same problem with their brioche bun falling apart as they tried to eat, this was definitely a nuisance. But on the plus side, the beef patty definitely wasn’t dry like most burger joints. Being a fan of cheese, I opted for the ‘blues burger’ which came with caramelized onions and stilton. I enjoyed this, but perhaps the overpowering flavour of sugar due to the caramelized onions left me feeling unsatisfied. Salt, who is not so keen on stilton, described it as eating ‘mould’. So perhaps, not to everyone’s taste. As sides, we ordered the absolute must with a burger; triple cooked fries to share, which I can’t critique. I kind of wish I ordered the fried chicken and waffle main, as I had initially intended to but chickened out (pun intended). Must also keep in mind trying out the brunch menu for next time. Food – 2.5/5 – The variety is limited, the brioche buns fall apart making it hard to eat. Although, the beef patty retains good moisture. Service – 3/5 – Bearing in mind that we were a large, late and loud group, the staff managed to maintain their composure with us. At times, they did make it obvious that they were particularly annoyed or not being able to handle the pressure of a large group. On the whole, they catered to our needs. Value – 2.5/5 – In central London location, situated among various other restaurants, the burgers were priced high, particularly when you add in drinks + sides. On average we paid around £15-20 including drinks + service. Venue – 3.5/5 – Situated in Kingly Court, a perfect hidden spot for dinner after shopping. Great atmosphere (although a little too loud at times with the massive speaker right behind myself). SAS – 3.5/5 – The main winning factor for SAS is it’s strange but innovate use of savoury vs. sweet flavours in its burgers. Plus, who else sells chicken and waffles with maple syrup? The drinks menu also includes ice-cream floats, which are hard to find, in-keeping with its American theme. Non-halal meat is not served, but Stax serves alcohol.